Flowers and leaves are distinctive elements of this chandelier. Open corolla of flowers catch the eye and seize attention even of the most absent- minded visitor. The veining of the arms and light chalices give a feeling of movement, softness and naturality. 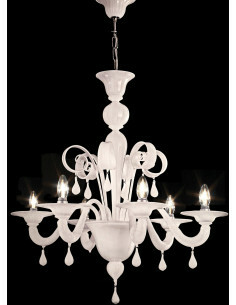 The chandelier is produced in 2 variants: white and crystal combination and more Baroque style, i.e. black and golden. A classic line having the unique elegance. Borders are available in various colours, i.e. light blue, white, blue, black, pink and green. A vast choice of colours to match the style of any space. Classic, elegant and rich. These are the characteristics that define blown Murano glass suspension lamp Jardin Enchantè in the best way. 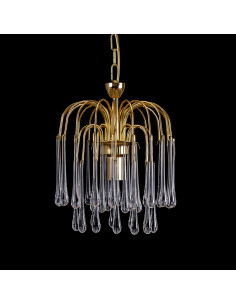 Crystal and gold blown Murano glass chandelier handmade by skillful artisans is the perfect mix of elegance, sophistication and uniqueness. Like the white colour recalls pureness of milk, blown Murano glass drops go down from pastorals, just like dew drops and fluid movement of water. A unique example of art and beauty studied and created by artisans to embellish any space, by giving shineness and refined design touch. The manufacturing time of the lamp is 20/ 25 working days. By choosing the Murano blown glass lamp, one opts for life full of elegance. The manufacturing time of the lamp is 20/ 25 working days. 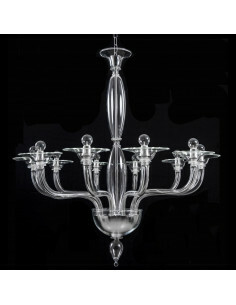 Suspension Lamp - "Silver Threads"
The Murano blown glass lamp is perfect for a living room, a bedroom or a hall. The manufacturing time of the lamp is 20/ 25 working days. 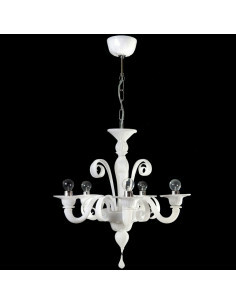 Murano glass chandelier with shade in white fireproof fabric with a diameter of 20 cm This model has a smooth and linear processing. 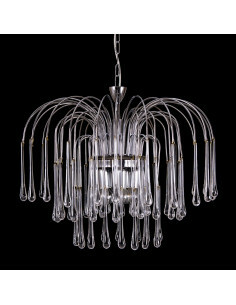 Modern simple, smooth and linear chandelier in Murano glass, entirely handmade. 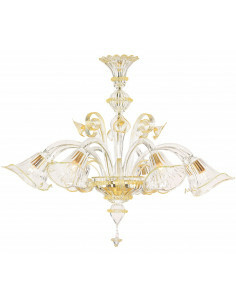 Original Murano glass chandelier, decorated in 24k gold. The central column is enriched with flowers. Classic and elegant chandelier, embellished with flowers and leaves hand-worked as in the old Venetian tradition. Smooth processing with a floral cup and ivory pleated lampshade for this Murano glass chandelier handcrafted according to the ancient Venetian tradition. 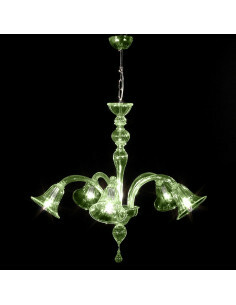 Chandelier in hand-blown transparent Murano glass. 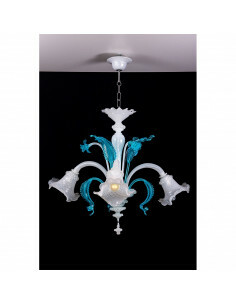 Classic chandelier made of Murano glass, handmade, enriched by high and low pastorals. Murano glass chandelier classic and elegant, enriched with leaves and flowers, produced directly in our furnaces, according to the ancient technique of Murano masters. 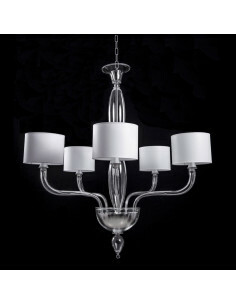 Mignon chandelier in modern and linear Murano glass. The characteristic of this chandelier is the reduced dimensions, so it is particularly suitable for small rooms, bathrooms and entrances. 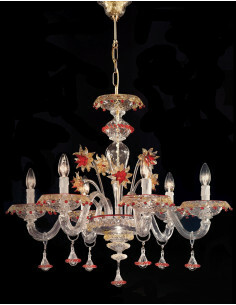 Classic chandelier in Murano glass enriched with leaves and flowers. Number of lights and customizable color. 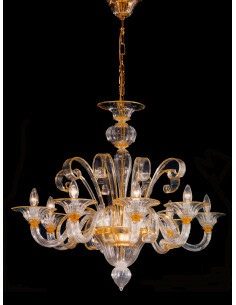 Handmade chandelier in classic and elegant Murano glass, made of crystal and gold cast in 24k. Each item can be customized by choosing the number of lights and colors. This Murano glass chandelier is available in several color variations and you can customize it by choosing the number of lights. On request you can also make the multicolor version. Murano glass chandeliers are the result of a precise work that is inspired by traditions that have been passed down for centuries, generation after generation: they are available in many variants - deco, classic, modern, floral, and so on - and they are able to make elegance a distinctive feature, by virtue of a refined and sophisticated aesthetic that makes them fit for the most diverse contexts. From the liberty chandeliers, with their unique and special style, to the so-called Ca 'Rezzonico chandeliers, which are known not only by the experts of the sector, there is a wide assortment of proposals able to satisfy all tastes. The glass is worked and processed with the best care so that it is possible to create truly exceptional artwork. Murano chandeliers are all precious and prestigious, and they can be gifted or collected, but also placed in a living room to be lit or in a bedroom to make it more romantic. According to the roots of a tradition which comes from the past, these artifacts can still be decorated and reinterpreted in a modern key, so that they can be adapted to every request. Murano Rezzonico chandeliers are the most beautiful: they are products that draw their name from being designed in the 18th century for the palace of the Rezzonico family in Venice, which is the building that hosts the '700 Museum nowadays. The procedure followed for making these chandeliers is precise and meticulous: after the execution of the metal structure, the pieces of glass are machined to one by one. As you can imagine, this is a completely artisanal job that requires a great deal of experience and remarkable mastery: it is no coincidence that Murano chandeliers are well-known and demanded across national borders all over the world.